So I spend a lot of time in front of a computer. This makes it a little harder to find time for vocabulary practice. 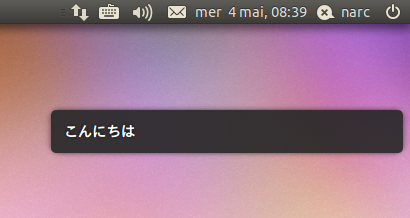 I’m not so big on expensive devices that creates a list of Japanese words or kanji – I’m sure there’s an “app for that” – but this little trick I found is free, you can set all the parameters you want, and runs on Ubuntu (and probably some other Linux distro). This nifty little program pops-up a notification bubble, just like the ones were are used to see for other purposes on Ubuntu. I then create a script that randomly selects a word or expression from a database then set a cron job that runs the script every minute or so. However, you need to tweak it if you send your message from cron. From a console, notify-send just uses your default X environment variables to display on your desktop but cron doesn’t know that and it won’t display anything. So you need to add your current X display before your script call. Feel free to customize your script to your liking and make sure you read the man page to notify-send for more parameters (length of display, box title, etc. ).